In the UEFA Champions League Chelsea faced Barcelona. The first half finished 1-1 at Stanford Bridge. 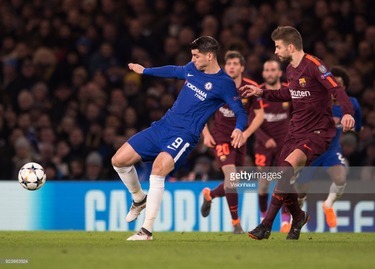 On the14th March Barcelona played against Chelsea at the nou camp. The kick off goal was scored by Lionel Messi and nutmegs Thibaut Courtois inside 3 minutes from a ridiculous angle. Another goal making it 2-0 Dembele doubles Barcelona’s lead. In the 45th minute Marcus Alonso has a free kick and smacks the post. In the second half Barcelona make it 3-0. Messi nutmegs the keeper again to make it his 100th goal in the champion’s league!